Commercial fountains are known to be an attraction and have the ability to draw people together. They are often used in lobby areas, waiting rooms, courtyards and near pools. No matter what the decor or landscape, there is a commercial water feature that will accent it perfectly. 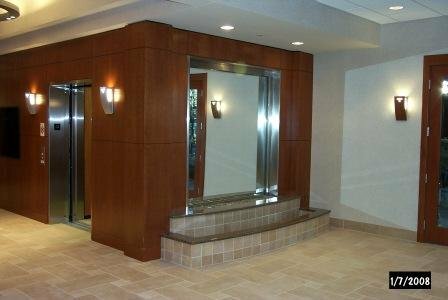 You will find wall and floor standing models available and all commercial water fountains can be made in custom sizes so you are sure to get the look you want. Interior Designers and Architects have been using indoor commercial water features for years as a necessity in home decor and commercial office design. These features are not only an art piece but provide a unique ambiance that draws people together and provides a relaxed atmosphere, just two of the benefits water fountains provide. Some popular settings you will see are places that want to draw customers and keep clients relaxed and coming back! For example, medical spas, massage therapy facilities, dentist and doctor offices, funeral homes, banks, legal and accounting lobbies and hospitals. Landscapers and architects have been incorporating outdoor commercial water fountains in many different settings as well. Not only in homes with yards that have room for a large water feature but also at hotels, office complexes, resorts, spas and hospitals. Everywhere you look there is water and everyone feels a sense of serenity when they are around it. There are many stock fountains that can be purchased for your commercial setting or a custom outdoor fountain can be built as well. Many businesses choose to have their corporate logo applied to the face of the fountain. Below are some examples of commercial applications that our fountain engineers have created. Fill out our custom water fountain quote request today and let us help you find the perfect water feature that meets your needs. You will also see some great commercial fountain's that are stock fountains which is a great way to get a large fountain for your commercial area but keep the cost down from a complete custom fountain design. 1. 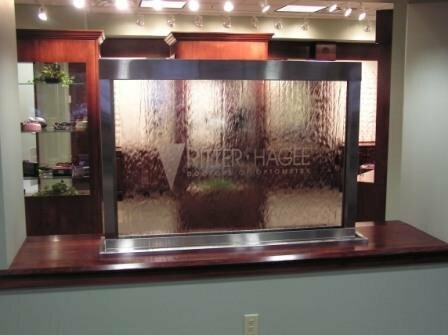 Below is an indoor commercial fountain in a custom size for an Optometrist's office to be placed between the office and waiting room. You will see the etched logo on the clear glass face of the fountain. 2. The below water feature is a fountain with a mirror and stainless steel frame custom built for a college campus. 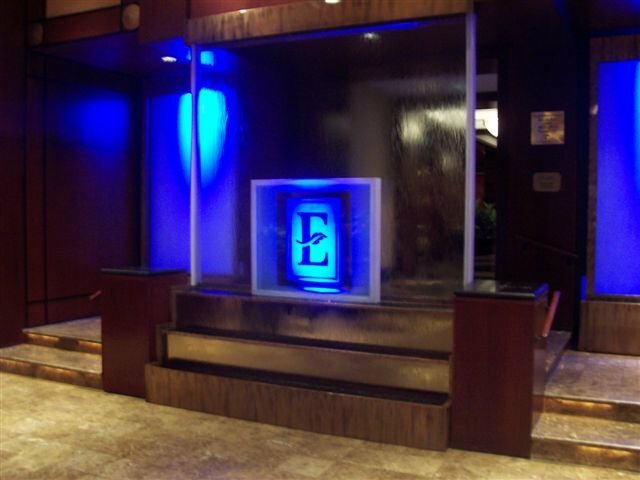 This unique feature with copper and glass was custom made for an Embassy Suites Hotel. 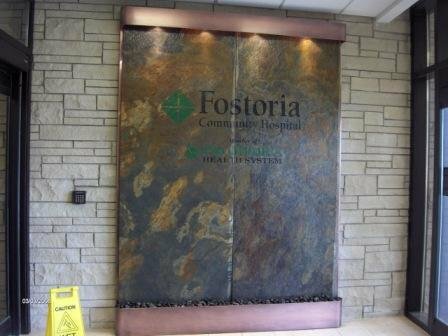 This is a custom designed fountain for a hospital. Face is solid slate and the frame is copper. 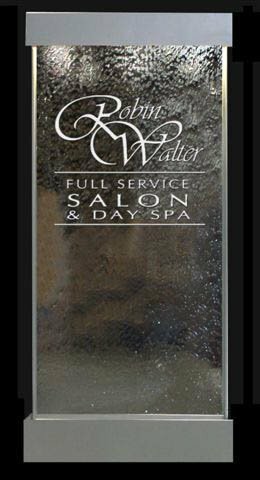 This commercial fountain was done for a Salon and Day Spa; Clear glass with a stainless steel frame. 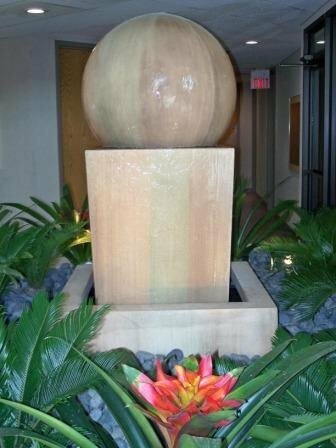 Here is a commercial fountain application using the Obtuse Fountain with Ball by Gist Decor. There are many styles of large stone fountains available. There are many more custom water fountain samples that were designed for the commercial setting. If you see something that you like or have a different idea in mind for your water feature, commercial or for your home, please contact us at 1-888-881-4668 or fill out the custom fountain quote request form.